One week ago, I have went to Japan for a vacation that lasted two weeks. It was a lot of fun and I will probably be writing about it in the following hundreds of posts. Only need to find some time for it. ^_^ I thought it was best to start with something small. During browsing in the many drugstores in Japan, I came across nail polishes of the brand "pa" multiple times, but I never really thought of buying a few. I found them to be a bit expensive for such a small bottle. The very last day, the guys with whom I was traveling with, wanted to shop at the Yodobashi electronics store in Akihabara. Luckily, I didn't have to be bored because besides electronics, the store also sells watches, bags, skincare, and cosmetics. 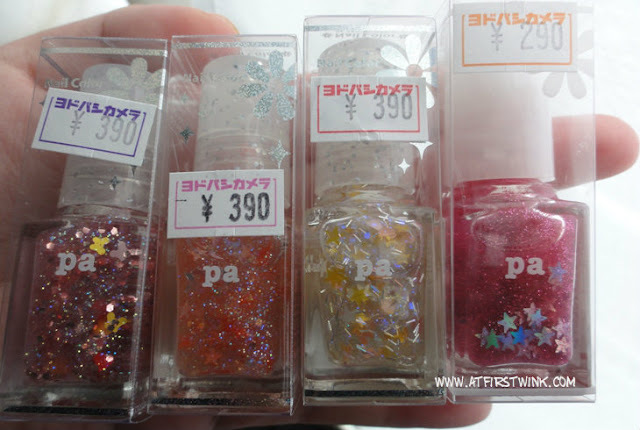 I happened to find pa nail polishes there too and as it was my last day in Japan and it was okay to spend my last yens, I reconsidered and bought a few of them after all, since they were so special. The glitters in the pa nail polishes really makes them one of a kind. From left to right: Pa Nail Color Premier - Lame grande AA11, AA05 and AA06. Pa Nail Color A46. From looking at the bottles, I thought they would all have a different base color. But they all look like glitter nail polishes with a colorless, transparent layer on my nails. Maybe it will look different, when I use a white pearly nail polish first, before applying the glitter layer on top. AA11, AA05, A46 and AA11. Out of the four nail polishes, I like AA06 and AA11 the most. The glitters in AA06 are small transparent holographic dots, silver stripes, and pink hearts, white stars and yellow stars with a pearly finish. The holographic dots make the nails seem more 3D somehow. It is very pretty. 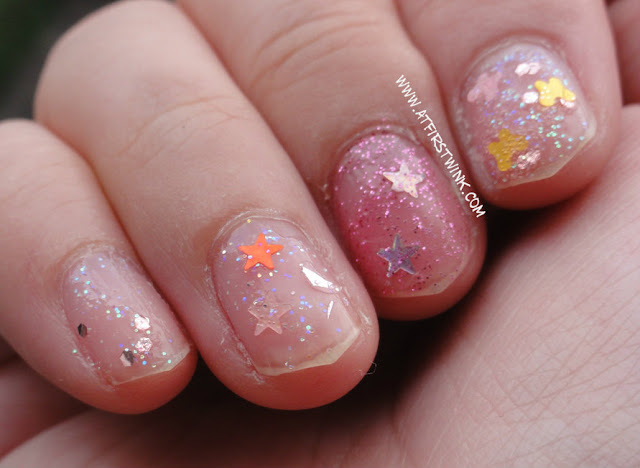 AA11 has small glitter mixed with larger octagonal pink glitter. It also has red hearts, pink hearts, yellow butterflies, and pink butterflies in it. I really like it, because even without digging the large hearts and butterflies glitters out, it looks beautiful on its own too. A46 looks nice, but it is rather plain. You can easily achieve this effect by sprinkling purple glitter on a normal transparent base coat. The holographic stars do make it a bit more special. Link with the swatches of pa nail polish A46. 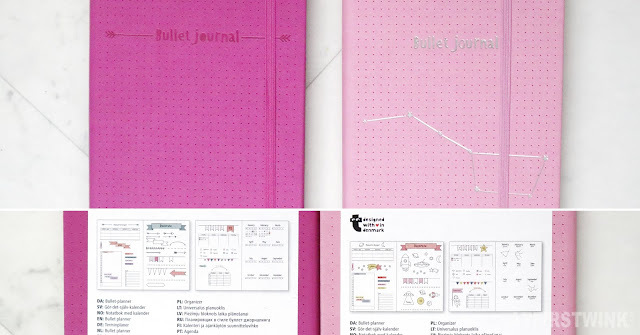 Lastly, AA05 has small glitter, pink moons, pink stars and red stars. 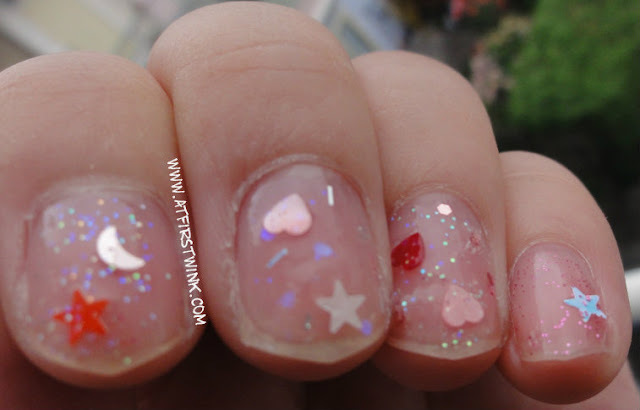 I don't really like this one, because without the stars and moons, it would only be a plain glitter nail polish. The red and the pink metallic color of the star and the moon glitters also do not match that well. Read more about my second Pa nail polish purchase over here.